Rent College Pads works hard to help college students at Clemson University find the best off-campus housing options in Clemson near campus. Whether you are looking for Clemson apartments or houses for rent, Rent College Pads is your number one resource for Clemson off-campus housing. Finding apartments at Clemson University has always been a chore. At Rent College Pads we are fixing that. All of our off-campus housing options have been verified and approved by our diligent team of campus managers. We even follow up with you and the landlord to make sure you have found your perfect house. Because there are so many options to consider before making a responsible renting decision, check out our Clemson University University apartment hunting guide below. October's a big month. The weather cools down a bit. Halloween gives you the opportunity to dress like an idiot without anyone judging you. And everyone in Clemson starts looking for an apartment for the following school year. To find your perfect place you need to at least begin searching in October and decrease your procrastination by a lot in November. There seem to be two types of students here. Half will search and sign before winter break. The other half will search and enter a waitlist before winter break and sign after consulting the parental authorities when returning from break. Live to the beat of your own drum but the better places go first. If you can find even the simplest job near campus, you'll have enough money for rent, especially if you live with a friend or two. While there are some expensive studios and one bedroom places, living with a roommate dramatically decreases your rent cost, which increases your having fun budget. Living on your own always will cost a premium, but in Clemson it's almost double the cost of living with roommates. We would recommend finding the sweet Clemson apartment or house for yourself with one or two roommates. It's hard not be indecisive when choosing what you want to eat or where you're going to drink next. That's why College Avenue can be the one stop shop for you. Take your parents out for a nice dinner and minutes later you can throw down with friends with a recovery breakfast the next morning. We have a list of noteworthy places we believe you should try. It's rumored you cannot graduate Clemson without stopping in at Mac's Drive In. We're sure you won't be disappointed with the food and for graduating after visiting Mac's. Late night breakfast food or even in the morning, either way, the 24-hour Huddle House is clutch. You don't have to venture far for the many Clemson University running and biking trails. For a night run, we recommend the Lighted Campus Loop which by the name is lighted at all times. Planning and buying equipment for any adventure can be quite a hassle. Also, you may not be in midseason form in the skill department for many of the adventures you want to take. Clemson University takes care of all of this for you with events that you can sign up for to explore the area. Afterward, you can always explore more on your own with equipment rentals. Football. Football. Clemson Football. The Tigers. Football. Are we on the same page yet? Clemson football and basketball are a great way to have fun and overall meet some really cool people. On any other day when you need to relax, Bowman Field can help with that. Plan a picnic for a nice afternoon or even toss a Frisbee while you hang out. With over 400 student organizations at Clemson, there are many groups for you to find your involvement. Intermural sports also have a very high participation rate from the student body. We don't want to give away a good spot, but some have troubles finding a nice beach on Lake Hartwell. There is a lot of foliage around lake Hartwell which makes it so beautiful but you may find a clearing at Y Beach. 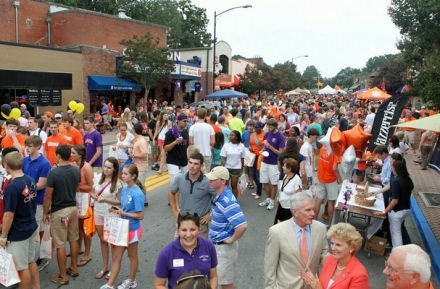 The City of Clemson has a population of just under 15,000, but when school is in session more than 20,000 students attend Clemson University and live in the city of just outside of the city limits. It takes about ten minutes, in a car, to get from one side of Clemson to another so students live all around the city, whether it be right around the university or downtown. The Clemson University campus is backed up to Lake Hartwell and the rest of the city wraps around it to the northeast. Scattered throughout the city are countless living options from single-family houses, duplexes, small apartment buildings, and massive luxury apartment complexes. Being that the city is small, a lot of where you want to go is walkable. However, the CATbus service, which is the second largest in all of South Carolina, is free and transportation system that services Clemson and some of the nearby cities. Clemson is a huge college town and both the city and the university work closely together to bring the community together. They have even been recognized by the International Town and Gown Association for the past five years as being the best at keeping a successful partnership between the city and university. Football weekends are a wonderful example of this! Clemson University and all of the residents in the city can’t be missed as they are decked out in all orange to go cheer on the Tigers! Crowds of over 80,000 head to Memorial Stadium, also called Death Valley, each Saturday. The university and city police officers come together to help move traffic along while all the gameday attendees support and buy from the local businesses. Littlejohn Coliseum is home to the Clemson basketball team and also bring the community together as many entertainers will perform here. The Brooks Center hosts music concerts, student theater performances, film screenings, and art exhibits for the city’s enjoyment. Charming Downtown Clemson has the majority of the area’s shops, restaurants, and bars. College Avenue and the cluster around there is the popular place to catch students any day of the week. Some of the hotspots, to grab both food and drinks, are Loose Change where on Tuesdays you can get $2 tacos and on Wednesday Wingin’ It has half price wings. A Tiger Town Tavern, they host karaoke and trivia night throughout the week. Crocs is the spot to hit the dance floor on a Saturday night. Some other top restaurants are Blue Heron Restaurant and Sushi and Sunnyside Cafe. There are also several coffee shops Downtown like Moe Joe where you can even catch some live music! Clemson is perfect for any outdoor enthusiast! The city is surrounded by mountains, waterfalls, scenic countryside, and lakes. Lake Hartwell, which borders the Clemson Campus and is in walking distance, is a popular spot for students to play volleyball, swim, kayak, or just lay out on the beach. The Issaqueena Trails has several different trails for people to bike and hike. 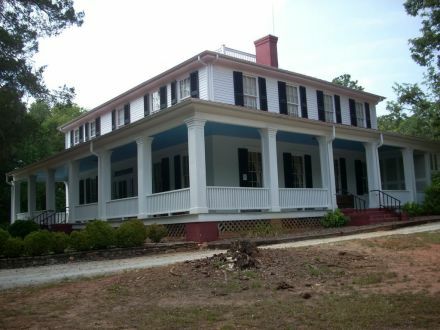 On the Clemson Campus, there is the S.C Botanical Garden that can be visited year round. Throughout the year, several community events are held all over the city. Some of these events are Clemsonfest which is a celebration of Independence Day. Each Christmas they have a parade. In May, they hold the Festival of the Arts, and each summer there is the Regatta on Lake Hartwell and the Clemson Farmers Market. The University also holds its fair share of yearly events like Rock the John and Tigerama to kick off Homecoming weekend. The town of Central is just a five-minute drive east from Clemson. Central is in located between Clemson University and Southern Wesleyan University which has contributed to much of the recent population growth. The area around the Wal-Mart Center has sparked a lot more commercial growth for the area. This small town was developed due to the train stop. A clock in the middle of town acts as the exact halfway point between Atlanta and Charlotte. Many families and workers used this stop to refuel, eat, rest. The railroad is still a huge feature of Central and there is the Central Railroad Museum. Just outside of Central on the border of Clemson is where you will see new large student apartment developments. The City CATbus allows students to live out there and have transportation to campus. Five minutes south of Clemson is the quaint town of Pendleton. The entire town is on the National Register of Historic Places and strolling down the streets is said to be like walking back in time as more than 50 buildings date back before the 1850s. Around the city, you’ll see old churches, cemeteries, and elegant mansions. Town Square has several shops, antique stores, and restaurants. Throughout the year, several events and festivals are held at Town Square like the Spring Jubilee, Fall Harvest Festival, and the Scarecrow Festival. Each of these events draws in thousands of people from the surrounding area. In the past Pendleton had been more of a living choice of young families and Clemson faculty members. Now, a lot more grad students and seniors are flocking here to get away from all the craziness of being on campus. With the recent expansion of the CATbus to Pendleton, it's allowed several more students to lease here.